Cat’s out of the bag…. So that cat’s out of the bag officially:) I outted myself on Facebook yesterday and with the exception of a few neighbors that will find out tonight most folks know now. This is really fun:) Now just waiting for the next big milestone – feeling the baby move. I have a few more weeks before that happens but I’m really looking forward to it. Nothing much else is happening lately. I’m feeling better and better these days. Still tired some times but most of the other symptoms have let up thankfully. Now i’m just trying to enjoy my growing belly and the knowledge that there’s a little person in there! I went looking for the HB last night with the doppler and found it immediately, the babe must be sitting towards the front and it’s up a bit higher than before. I could also hear him moving around and kicking at the doppler (it’s a very distinct “pop” sound when he does it). PS. Yes, i’m calling it a he for now. I have no idea yet but my gut says boy so we’ll see. Our big U/S is Oct 15th – which is way too far away at this point! Okay, I said I’d be brave and give you a belly shot this week. I still think much of it is bloat but I can’t fit into 90% of my pants now without the bella band so that must be something:) Our NT scan results are back and everything is great! We have a 1:1559 chance of a baby with Downs Syndrome and a 1:10,000 change of Trisomy 13 or 18 so those are fantastic odds! The geneticist said that my Downs odds were that of a 20 year old – ah to be that young again, haha! The highlight this week is making it to 13w 3d and finally dropping into the second trimester where your miscarriage risk drops way down! I’ll go from about 5% to something like 1% so that will be a relief. I’m still finding the HB on the doppler every few days and it’s getting easier and easier! Now i’m even picking up with the little bean moves because it causes feedback on the doppler! I imagine he/she punching (or kicking) the area where I’m pushing down saying “get away mom…”. The books i’m reading say that the baby responds to stimulus now so my poking around can provoke a reaction – if only we had a permanent window into my ute! Symptom wise things are easing up (although they’ve never really been bad in the first place – i’ve been very very lucky!). I have alot of hip and pelvic pain (more aching than anything) that I’m almost positive is from my hips and pelvis shifiting and spreading to accomodate the growing child (who’s the size of a peach btw!). I’m still very tired and notice that it’s very easy to over do it but am finding that when it’s time to go to bed, I can’t sleep – what fun! And I really only get nauseous when i’m really tired or very hungry so I’m trying hard to just graze throughout the day and then take it easy in the evenings after dinner. I did join the YMCA recently so I’ll have to start using that soon – hopefully in another week or so my energy levels increase and I’ll actually feeling like going for a swim! Anywho….things are moving right along! I can’t believe we’re already to the second tri! I think this is going to fly! Today was a day full of dr’s appts! We did our normal 12 week OB appt and then later in the day went for our NT scan (read: ultrasound) and bloodwork. So far everything looks perfect! The baby had all the right parts and measurements and was even kicking around in there which was crazy to see! 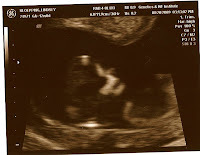 It’s really starting to look like a little human with hands and feet and a profile! So, even though we’re still a week shy of the second tri we’ve decided to let the cat out of the bag with folks and finally tell the rest of the family and set my mother loose to shout it from the mountain tops! I honestly think she’s been on the phone non stop since i called her after the appt to give her the all clear:) The woman is just going thru her roledex and I think it’s hilarious (and really cute, they’re so excited!). 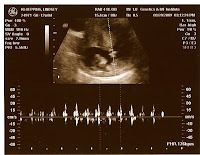 Above is a profile of the bean, you can kind of see a hand hovering over the abdomen. The image above is smaller but highlights the heart and the heartbeat! 176 going strong! The doc says that’s on the higher end of the range so if you believe in wives tales you may already have an idea of what that little bean is. This one is a closeup of the face. The white areas are all bone and while it looks a little freaky (DH called it our little Skeletor), it shows all the bone in the right places. You can make out the jaw, nasal bone and even the start of the forhead and eye sockets! Our next appt is in 4 weeks and then our next U/S is in 8 weeks (at 20 weeks 2ds) where we’ll find out what we’re having! Yes, we’re going to find out. DH and I are both HUGE planners and need to know so that we can prepare. 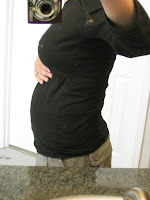 Maybe in the next post I’ll show a belly pic or two…I’ve been taking them every week but so far there’s not been much change. 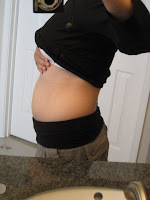 The bloat is finally going down and I think I see a little bump starting to form – how fun! We were trying to think of a special way to tell my in laws since this was their third grandbaby. Ever since we got back from Europe FIL’s been hitting me up for more pics of our trip (like the 120 he’s already been thru wasn’t boring enough:) ). Anyways, I figured that we could use that to our advantage and tell them. So, I picked another 15 or 20 images to put into a slide show and then let DH have at it with his masterful computer skillz! He put the images together and set the last two up to be a pic of me with the positive pregnancy test in my hands and a pick of the bean at 8 weeks. I’ll have to see if I can compress it enough to get up on here without causing problems. They were definitley suprised and even a bit teary eyed:) It was a fun way to tell them. And since we have filled them in, I’ve spilled the beans to a few more folks. I really need to stop for now though and wait until after our appt next week! I had to tell my boss because I was afraid it would break on Facebook. And i told a few i the know co-workers who knew about our struggles and that i’m close with. For now that’s it. I figure I’ll come out of the closet after our 12w appt next week. I’ve always been a bit of an emotional person. Seeing other people cry usually starts me crying (be it on TV or in person) but I’m generally able to stop it before anyone notices. Thanks to another beautiful side effect of pregnancy, increase in hormones, I’ve turned from an occasional crier to and uncontrollable blubbering idiot at the drop of a hat. Once I get started, it’s tough to stop. I find myself crying for really no reason at all. This is fun! We told my parents today and then my brother this evening. Seeing their (or hearing in my brothers case) reactions is priceless! My mom of course was in tears which then set me off:) My dad was all smiles and proceeded to take copious amts of pics of me and my non-belly:) My brother was in shock I think. I told him over the phone so it’s hard to gauge:) If I counted correctly, he said wow like 20 times! I’ve always known how I wanted to tell them. I bought two photo albums – a small one for my mom that would fit in her purse and a larger one that my dad could have on his desk. I used scrapbooking letters to spell out “Grandma K’s Brag Book” and “Grandpa’s Book” on the front of each. In both of their albums I had a copy of our last ultrasound. My dad got it right away and his face broke out into a huge grin. My mom took a second to process and then started crying:) They were both pretty cute and floored by the news. My brother is a huge cell phone text message user. If you need him, that’s how you get him. 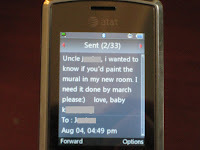 So, I wrote him a text that said: “Uncle J, I wanted to know if you’d paint the mural in my new room. I need it done by March:) Love, baby k”. It took him 2.5 seconds to call me back saying “what? ummm…. what? does that mean I’m going to be an uncle?”. It was really cute! He too was floored:) I think he’s probably still soaking it in! We have yet to tell DH’s parents and sister – that’s a task for this weekend. 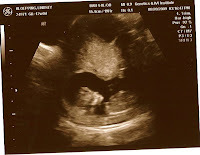 Then I think I’ll wait to tell my grandparents until we have our 12 week ultrasound – i’d hate to let them down if something were to happen because they’re going to be so excited! Anyways, I’ll update the other stories once we get thru them. I’m not entirely sure how we’re going to tell them. We’re thinking about roping my little nephews in to tell my SIL. This should be fun! So, I swore to myself that I wouldn’t go and buy one of those home doppler devices but call it temporary insanity, I bought one on Amazon the other day:) Well, it arrived today and you can bet that I dropped everything I was doing and spent a good 30 min getting use to it and trying to find the heartbeat! It did take about 10 min and lots of moving around to finally find it but there it was – beating 160 bpm! The first few movements revealed my heartbeat (which i found in lots of interesting places in my abdomen!). I could tell it was mine because it was really slow (about 100 bpm). Plus, i was able to match it up to my pulse in my neck. But finally, really low down, over my bladder, at a 45 degree angle pointing down towards my cervix, I found it! What an awesome sound! Ah, i can sleep better at night knowing that I can listen to the little bean whenever I want. Now I’m just hoping that I can find it again tonight when DH gets home. Things are just swimming along right now. The spotting has stopped thankfully although I’ve developed a new symptom that’s just plain annoying – having to get up in the middle of the night 2-3 times to pee! There goes my uninterrupted night of sleep now. Guess I better get used to it as that’s going to be the reality once this baby arrives! I bought my first maternity clothes the other day. I ordered 2 bella bands, 2 old navy shorts and 2 old navy shirts. One pair of the shorts has to go back – they’re huge and by the time i’d fit them, it will be fall and I wont need them anymore. The bella bands are awesome! Since on some days I’m to the point where my shorts won’t fasten, the bella bands help span the gap and allow me to leave the pant undone to make it more comfy. Anyways, not much else going on. We’re telling my parents on tuesday and the hubby’s parents the following weekend! Then i’m off on a business trip that will carry me thru my 11th week. I’m not sure i’m goign to tell anyone yet. I’ll be back in town again after my 12 week appt so I think I’ll wait until then.